NECO’s Reverse Osmosis System is designed ultimate water and energy efficiency for the most demanding industrial and ultra high-purity applications requiring ultra high water quality (98-99% salt rejection). Catalogue nominal output capacities of 36,000-720,000 GPD (25-500 GPM). Specially engineered skids can be designed unto 800 gpm and can be customized to meet any engineering specifications or tight foot print. 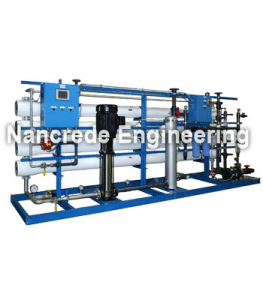 Multiple RO skids can be used to achieve high flow rate RO Systems. SDI, Portable DI (deionization) Exchange Tank Systems can be added after the RO system to change it from a high-purity to an ultra high-purity water system. For larger applications such as power and petrochemical plants or other heavy use, high-puirty water industrial plants, an onsite regeneration based industrial mixed deionization system or electrodeionization (EDI) system can be added as a polisher and may be more cost effective than SDI. High rejection, 8″ x 40″ thin-film composite (TFC) membrane elements in a spiral-wound configuration.